“The Mondragon cooperatives and the United Steelworkers have announced an historic partnership through which they will buy or start manufacturing businesses in the U.S. and Canada that will combine Mondragon’s democratic structure of ownership and governance with collective bargaining. The Mondragon Cooperative Corporation (MCC) is the world’s longest-running, highest-grossing, most successful experiment in workplace democracy. Now 53 years old, the Basque association of worker cooperatives consists of roughly 260 cooperative enterprises with more than 100,000 employee owners.It is the seventh largest corporation in Spain and the world’s largest industrial workers’ cooperative. Its enterprises include its own university, research center, and bank. In January 2001 I visited Mondragon with a small group of Americans for a four-day examination of the culture of both the town and the MCC. Having used a version of the Mondragon principles as the basis for the restructuring of South Mountain Company fourteen years before that, it was thrilling to get a firsthand look at this system of worker-owned cooperatives that appears to be unparalleled in its dynamism and its impact on a region. Mondragon has created a total system wherein people can learn, work, shop, and live within a cooperative environment. The town, in its isolated valley, has a vital, prosperous feel—a small bustling city with a comfortable mix of young people from the university, new middle-class families, and those who have been in the valley for generations. The surrounding hills are verdant and productive, dotted with villages and farms. The MCC’s influence reaches into every aspect of community life. I’ve always wondered why the amazing story of Mondragon is such a secret in the United States. It has attracted significant attention worldwide, but far less here. Even the U.S. based socially responsible business movement pays it little mind (as it does the issue of ownership in general). Is the idea that capital is a tool, rather than the residence of power, too radical to embrace? Instead of awarding profit and control to capital, Mondragon has succeeded by awarding profit and control to labor in a system of democratic capitalism. It has developed an enduring way to use capital productively and distribute income equitably at the same time. 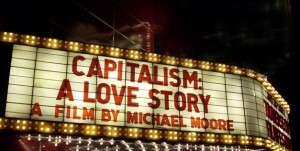 For too long the idea of worker-cooperatives as a potent business model has flown under the radar, but in Michael Moore’s new film: Capitalism: A Love Story (marquee photo) people all over the country have been seeing worker cooperatives and workplace democracy in action. He presents them as a possible solution to the undemocratic, inequitable and greed-driven economy that he spends most of the film building a case against. Featured on film are Alvarado Street Bakery in Rohnert Park, California, and Isthmus Engineering in Madison, Wisconsin. Scenes of workers making decisions, working on production lines, and eating and laughing together paint a picture of worker cooperatives that stands in marked contrast to the exploitation and abandonment shown in other parts of the film. The new Mondragon/Steelworkers association will further raise the profile of cooperative business in the U.S. More importantly, it may jump start the crucial re-industrialization of the nation that is so essential to our future. I’m excited by the prospect of seeing where this will lead. This is very exciting news indeed, John! I have heard about Mondragon over the years, including in your book, Companies We Keep. It is thrilling to think of this model spreading, where workers are respected and enjoy their work. This development is part of the silver lining in the current economic state of affairs. In my work as a small business coach I discuss alternative ownership models with clients from time to time. I think the possibilities for small business, as well as large, are amazing, even though it will take a long time to implement and gain a lot of traction. The most powerful ideas start small, though, don’t they? I am reminded of that as I read Team of Rivals by Doris Kearns Goodwin about the Lincoln presidency and the beliefs at that time about black people. As MLK said, ” the arc of a moral universe is long, but it bends towards justice.” I think creating democratic, socially responsible, environmentally sustainable businesses is a moral issue, too. Yes, Anne, I think this is big news! I’m going to be very curious to see where it goes. My favorite thing in Team of Rivals was when Lincoln’s eight cabinet members unanimously opposed an idea Lincioln was championing. Said Lincoln: “Nays eight, ayes one. The ayes have it.” When will Obama be ready to act with such certainty? Hey John, so glad you shared this information with others and now I really want to go see Michael Moore’s latest — I didn’t know he featured worker-owned ventures. I’ve really enjoyed your blog and am impressed with your discipline in getting it out regularly with consistently interesting and thoughtful content. Great work by USW and Mondragon! Are you guys on facebook? No Tino, we are not. Why do you ask? You need to get on Facebook because there are a few people there looking for a better answer to our problems than Capitalism/Communism. The Steelworkers initiative with Mondragon makes all the sense in the world. But it is being ignored by other Big Corporatist “unions”. Help spread the word everywhere to every working stiff in the world! I just have found this website about the Mondragon experience, and the new challenge in the US territory. I can say that this is one of the most profitable ways of working, regarding the economic, spirutal and “justice looking”.